Napa was once considered the sleepy city you passed through to get to the “good part” of Napa Valley, but that has quickly changed. It is now considered a great home base for any California wine country adventure. What made this transition happen? There are really several reasons, but most importantly, it was citizens coming together to make change. As the engine of Napa Valley, the city is full of dreamers and doers doing great things to create a unique destination. From 3rd generation wine makers, to first time brewers, to citizens coming together to attract unique art, Napans are in a class of their own. Also, located just 60 miles from San Francisco and siting at the entrance of the legendary Napa Valley, Napa is perfectly situated for visitors. It is arguably one of the most strategically located destinations in the U.S. Between the citizens and visitors it attracts and the geographical location, Napa is in prime position to be a world renowned destination. And the city is quickly becoming an absolute must do on any Napa Valley visit. So, what exactly has the city been doing to create a world class destination? First they needed to fix the foundation and then the they needed to make things happen. And that is exactly what they have been doing…. The recent surge in development started when several diverse interest groups came together to fix Napa’s flooding issues. Why was this needed? The Napa River floods have inundated the Valley on a regular basis for thousands of years. Since record keeping started, 21 serious floods have been recorded. More notably, Napa County residents have suffered $542 million in property damage since the 1970s. This flooding drove businesses out of the area and discouraged development. In order to address this issue, in March 1998, a proposal to add a half-cent to the Napa County sales tax to fund a flood project was voted on by the citizens. More than 27,000 ballots were cast, and the measure passed with just 308 votes to spare (voting matters!). Since this measure passed, the multi-objective flood plan was implemented. This project restored more than 650 acres of high-value tidal wetlands of the San Francisco Bay Estuary. What does that really mean? It means, the flood project has protected 2,700 homes, 350 businesses, and over 50 public properties from 100-year flood levels. It also created a savings of $26 million annually in flood damage costs. The end result is a “Living River” design that protects all county residents from damages caused by regular flooding. Now that the foundation has been fixed, the city is prime for development. Now there are endless opportunities for citizens and businesses to create a world-renowned destination without fear of flooding. And this development has already started. So far, there has already been more than $1 billion invested in downtown alone. This investment is creating a distinct destination that includes unique art, a variety of lodging, stylish urban tasting rooms, exceptional restaurants, and a growing craft beer scene. So, what does Napa look like now and where will it be soon? Keep reading and next thing you know your bags will be packed to visit one of the most strategically positioned destinations in the U.S. While there are benefits to being strategically located, there are also downfalls. If you have ever driven up Highway 29 on a Thursday afternoon you know what I mean. The traffic in the valley is terrible. In order to relieve some of this congestion, Napa has been transforming areas of the city to make it more pedestrian friendly. This makes a lot of sense for more reasons than just traffic. First, let’s face it, a lot of people around here are drunk or well on their way. That’s great, but drinking and driving is a no no. Also, who doesn’t love to live in or visit a walkable city? Studies continue to show a walkable city is a happy city, and who doesn’t like to be around happy people? Which leads to my final point, we’re in California….go outside! One of the largest projects in the valley to encourage walking is the Napa Valley Vine Trial. This grassroots labor of love will be a 47-mile walking & biking trail system from the Vallejo Ferry Station all the way up to Calistoga. Eventually, people will be able to get from the city all the way to Calistoga without getting in a car. At this point, there are 12.5 miles complete. Which means you can now use the Vine Trail to go from South Napa all the way up to Yountville. A beautiful easy ride with several sites and stops to see and do along the way. You can check out the artwork of RAD Napa, hit up cool wineries like Ashes and Diamonds or makes your way to Yountville and eat your way down Washington St. There is a little something for everyone and a great time to be had by all. You’re not an artist but you can appreciate looking at great art? Or you’re an art enthusiast and want to see pieces from world renowned artist? Napa’s got you covered. The city is crawling with public art that can be appreciated by everyone, no matter how you interpret it. The Art Council Napa Valley is the leading advocate for art in the community. This was another grassroots effort by passionate community leaders to organize and support the arts. Two of their most popular programs are the Napa Artwalk and Arts in April. The Napa Artwalk is an outdoor sculpture exhibition with a variety of three-dimensional artwork throughout downtown Napa. Arts in April celebrates the connection between art and wine by showcasing art in the valley’s wineries, galleries, museums, and performance venues each spring. More recently, the council partnered with other community and business leaders to create RAD Napa. RAD Napa, short for Rail Arts District, is an art movement transforming a semi-industrial stretch in the city. After seeing the power of public art in places like the Wynwood Walls in Miami or the SODO Track in Seattle, the city was inspired to create a new cultural corridor along the railroad. 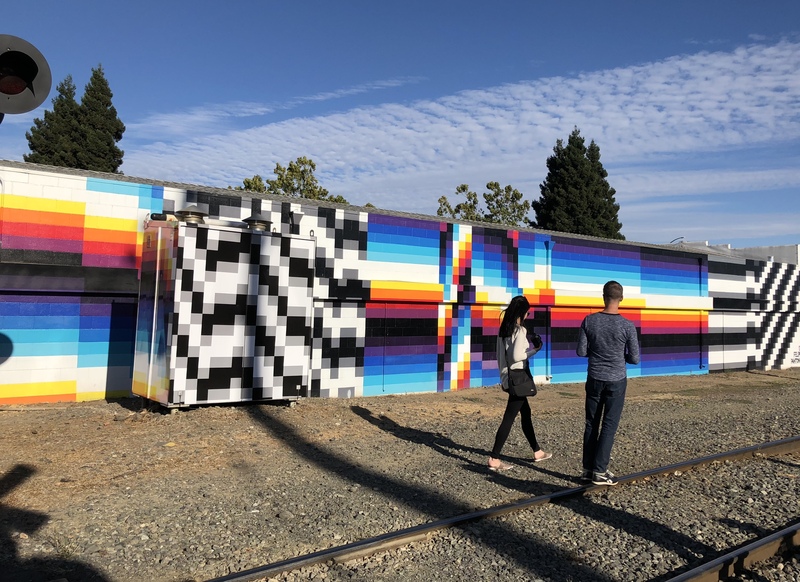 Already home to pieces by world renowned street artist like Felipe Pantone and Fintan McGee, RAD Napa will be a 2 mile outdoor gallery with over 130 art installations. While going up valley to experience some of the most amazing wineries in the world is a must, the tasting rooms in the city take on a whole new personality. With nearly 40 tasting rooms in downtown Napa alone, there is endless opportunity to satisfy even the most ambitious wine enthusiast. And while you can’t go wrong with Napa Valley wine, you can find an atmosphere that may not be the right fit for you….and that’s ok. Fortunately for everyone, Napa has a diverse community with a variety of influence. There is a little something for everyone…just like California herself! You want more upscale, you got it! You want more laid back, you got that too! Or, you don’t care and just want friendly service and a really good time, you bet Napa has you covered there! Overall, the tasting rooms in the city are a destination themselves not to be overlooked. If your anything like me, a nice craft beer after a long day of wine tasting is just what the doctor order. Well, maybe not the doctor but at least my taste buds. And lucky for us, the Napa craft beer scene is continuously growing. The city of Napa is now home to nearly ten breweries all with a distinct style and atmosphere. You can visit urban nano-breweries to try amazing rotational beers from the only female wine maker/master brewer in the country at St. Clair Brown. Or head over to the larger Stone Brewery in the beautifully restored historic building by the river. You can also take your craft beer experience up valley on the Napa Valley Wine Train. They have jumped on board the growing craft beer scene and partnered with local brewer Palisades to create the Hop Train. Napa’s First Street underwent a remarkable $200 million transformation to become the anchor for downtown. This includes upscale lodging, dining and retail. With openings that began in fall 2017, First Street Napa is a 325,000 square foot mixed-use development. This development will add over 45 shops and restaurants to create a landmark destination in the heart of downtown Napa. The project has brought leading architects, designers and artists together to create a unique Napa look that is warm, inviting and authentic. Covering three city blocks, the development is an eclectic blend of new, renovated and historic buildings. It also includes a growing vibrant public art program to promote pedestrian traffic through the area. There are just over 5,000 rooms/units in Napa Valley, with over 3,000 located in the close vicinity of downtown Napa. While that is significant, there are an additional 1,800 rooms either pending construction or in the design phase. The options are endless when it comes to lodging around the city. From boutique hotels like the recently opened Archer Hotel, to historic B&Bs like the Hennessy House, to resorts like the Westin, the city is bustling with a variety of accommodations. While staying in the heart of the city, Napa hotels are conveniently located close to the action while also providing a beautiful view. Guests can enjoy world renowned restaurants, boutique wine tasting rooms, stylish shopping and art galleries all within reach to the walkable downtown. If you are a Napa Valley regular or hoping to cross it off your bucket list someday, the city of Napa should be a stop on your itinerary. Come for the day, or make it your home base for the trip, you are sure to have a memorable time. The city of Napa is definitely a “must do” on anyone’s next Napa Valley adventure.